Seasoned hunters looking to expand their kitchen repertoire will certainly be pointed in the right direction with this comprehensive guide. For the true gourmet, nothing beats the freshest cuts of meat, especially when it is free-range and naturally fed. But this can also be a prohibitively expensive way to eat. The alternative to store-bought meats is, of course, hunting. Hunters have access to what is essentially the freshest and healthiest meat, poultry, and fish available; they just have to get it themselves. Wild Gourmet merges the worlds of hunting and culinary excellence in a thorough and beautifully illustrated book. Compiled by the Boone and Crocket Club (a hunting club formed by Teddy Roosevelt), it is an excellent source of otherwise difficult-to-find information. The chefs involved in Wild Gourmet present not only dishes inspired by a wide variety of culinary traditions (including Mexican, Indian, Japanese, Italian, and others) but also an intriguing assortment of meat. Everything from salmon to squirrel turns up here. A substantial portion of the book is dedicated to processing the meat. Since the average American cook knows little of this beyond skinning the occasional chicken or deveining shrimp, this section is highly informative. Processing is meticulously documented, so much so that the less dedicated chef may find the photographs a bit disturbing. Hunters, on the other hand, are not generally a squeamish bunch, and it is hunters, after all, for whom the book is written. Most of the recipes involve straightforward, uncomplicated, and clearly explained techniques. Wild Gourmet may become daunting for most home cooks insofar as the equipment needed to process venison, elk, or other large game, in addition to the storage space required once the game is processed. The same goes for smoking or cooking on a spit. But for a hunter and chef with an outfitted cabin out in the country, this is all quite feasible. 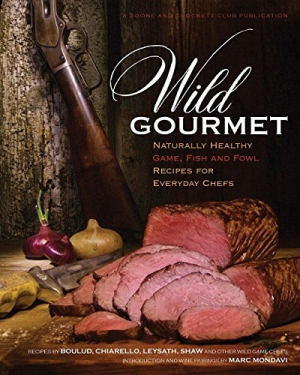 Wild Gourmet is a colorful, visually appealing hardcover volume with an elegant cover. Given the popularity of Paleo diets and the farm-to-table movement, this book provides a wealth of information for those wanting to go one step further.